VINTAGE COSTUME ESTATE ANTIQUE JEWELRY NECKLACES! ANTIQUE COSTUME JEWELRY, ESTATE COSTUME JEWELRY, RHINESTONE CRYSTAL VINTAGE JEWELRY, FASHION JEWELRY! WEDDING, BRIDAL, BRIDESMAID, PROM AND pageant jewelry and fashion jewelry NECKLACES. 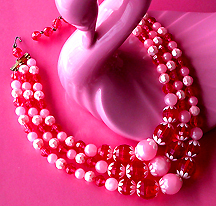 Item #N168466 - Three Strand Red And Pink Lucite Bead Vintage Estate Antique Bib Necklace. Size: Length: 17" including the 3 1/2" extender. 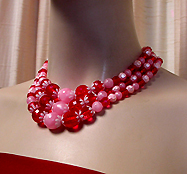 Beautiful graduated three strand bright red and soft pink lucite bead vintage necklace! 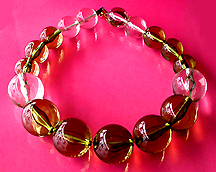 Bright red, soft pink, smooth and faceted beads exude gorgeous contrasts. 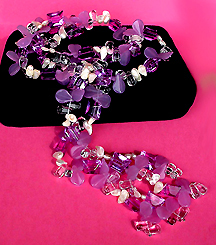 Soft pink petals form pretty flowers in the center with bright red lucite beads glittering like crystals! The largest beads measure 5/8" each! Excellent condition. A fabulous necklace to wear at weddings, prom nights, pageants, parties, cruises and special functions! US$118.00. Item #N168463 - Chunky Olive Green And Clear Glass Bead Vintage Estate Necklace. 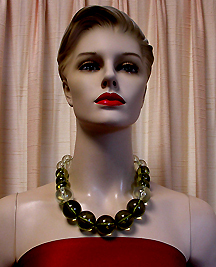 If you love bold statement jewelry, this beautiful olive green and clear glass bead graduated vintage necklace is speaking to you! 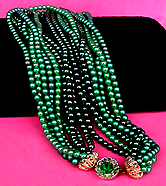 The largest beads measure 1 3/8" each and the smallest 7/8"! Ultra reflective like wearing large glass bubbles around the neck base. The generous length enables you to wear it longer or shorter. Please see the enlarge photos. Definitely a gorgeous, unique, conversation statement piece, simple yet so commanding! Excellent condition. A fabulous necklace to wear at weddings, prom nights, pageants, parties, cruises and special functions! US$138.00. Item #N168440 - Signed Lisner White Faux Pearl Goldtone Vintage Estate Antique Designer Necklace. This beautiful signed Lisner designer vintage necklace boasts shiny etched articulated swirling goldtone bands with lustrous smooth round white pearls proudly displaying among them! The support chains are soft pearl strands that go around the neck. Excellent condition. A fabulous necklace to wear at weddings, prom nights, pageants, parties, cruises and special functions! US$138.00. Item #N168432 - White Faux Pearl Aurora Borealis Crystal Bead Vintage Estate Antique Necklace. Single lustrous white faux pearl strand divided into 10 sections by sparkling Aurora Borealis clear crystal diamond-shape faceted beads! Each crystal bead measures 1/2" and has a pretty golden cap and antique brass space bead on each side. Excellent condition. A fabulous necklace to wear at weddings, prom nights, pageants, parties, cruises and special functions! US$88.00. 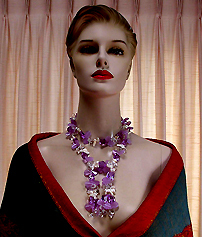 Item #N168443 - Signed Coro Two Strand Pastel Bead Lucite Crystal Vintage Estate Antique Designer Necklace. Flaw: Tiny cracked lines on two beads. Not noticeable at all. Size: Length: 18" including the 3" extender. Designer: Signed Coro in script. 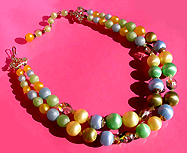 Signed Coro designer vintage pretty necklace features lovely color beads of pastel yellow, green and blue. The beads are made of plastic. They are smooth and have a silky quality to them. 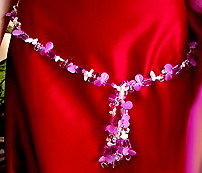 This wonderful necklace also has faceted lucite beads made to look like Aurora Borealis crystals. Light weight. Excellent condition. A fabulous necklace to wear at weddings, prom nights, pageants, parties, cruises and special functions! US$88.00. 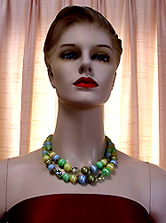 Item #N168423 - Two Strand Faux Pearl Vintage Estate Antique Necklace. Size: Length: 22" including the 3" extender. Pure luster! Two graduated strand of ultra lustrous glass pearls individually hand knotted to keep each exquisite pearl in place. The largest pearls measure generously at 3/4" each! The pearls have a slight lilac tone to them, very pretty! Excellent condition. A fabulous necklace to wear at weddings, prom nights, pageants, parties, cruises and special functions! US$98.00. 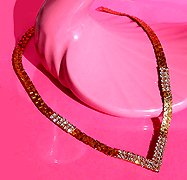 Item #N168435 - Clear Crystal Rhinestone Textured Goldtone Vintage Estate Necklace. Item #N168409 - Clear Crystal Rhinestone Silvertone Vintage Antique Estate Collar Necklace. Item #N168411 - Art Deco Style Ruby Red Pastel Pink Crystal Vintage Antique Estate Fringe Necklace. Size: Coil necklace fits any adult neck size. Shimmering ruby red crystals form an inviting perfect circle. The front has pastel pink glitzy diamond shaped crystals for contrast and cascades eleven graduated strand drops from the center in the French style called pampille. The strands have glistening pastel pink, ruby red and metallic brown crystals with the middle strand slightly longer to eccentuate an Art Deco and drippy effect. Both ends on the back have a dangly ruby red glitzy crystal beads to complete this exquisite design. The center fringe drop measures 1 1/2" wide and 3 1/2" long. Excellent condition. A fabulous necklace to wear at weddings, prom nights, pageants, parties, cruises and special functions! US$148.00. Item #N16898 - Juliana Powder Blue Givre And Glass Cabachon Aurora Borealis Silvertone Vintage Estate Antique Necklace. Size: Length: 15" and adjustable. This stunningly ravishing Juliana necklace features powder blue marquise collectible givre stones, reflective glass cabachons and Aurora Borealis crystal rhinestones. For those who are not familiar with givre stones, they are crystal rhinestones that have colored patterns infused in them. These beautiful sparkling stones are individually mounted in open back silvertone setting. This breathtaking Juliana beauty is not only exquisite but very collectible as well. Excellent condition. 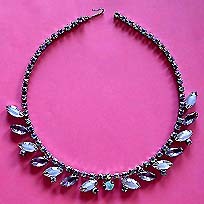 fabulous necklace to wear at weddings, prom nights, pageants, parties, cruises and special functions! US$128.00. Item #N168414 - Unsigned Lisner Mother Of Pearl Disc Goldtone Vintage Estate Antique Necklace. Size: Length: 17 1/4" and adjustable. This charming unsigned Lisner vintage necklace has 11 luxurious Mother of Pearl disc links adorned femininely with high-polished shiny goldtone articulated leaf garland! Each Mother of Pearl disc measures 3/8". Excellent condition. A fabulous necklace to wear at weddings, prom nights, pageants, parties, cruises and special functions! US$128.00. SOLD. Item #N168391 - Versatile Lavender Crystal Genuine Pearl Jade Sterling Silver Lariat Necklace / Belt with Tassels. Generous length of 46 1/2" allows versatility to wear this beautiful lariat necklace in different styles. It can also wear as a belt. A tassel at each end to add beauty and interest. Gorgeous colors of Lavender gemstone beads, clear and purple crystals, pastel purple jade leaves and textured genuine white pearls strung in sturdy sterling silver wire for durability. Well-made and high-quality. Mint condition. A fabulous necklace to wear at weddings, prom nights, pageants, parties, cruises and special functions! US$188.00. 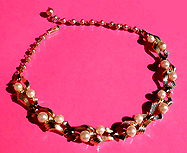 Item #N168413 - Signed Park Lane Tahitian Faux Pearl Twist Rope Style Vintage Estate Necklace. Designer: Signaed PARK LANE on a goldtone metal hanging tag. Four strands lustrous Tahitian faux pearls done in a twist rope design with grouped white faux pearls and gold colored beads dividing the necklace symmetrically in equal sections. It has a large gleaming goldtone cap on each end. One end dangles proudly the Park Lane name tag. This beautiful pearl necklace is so classy and suits almost any occasions. You'll reach for it often! Near mint condition. A fabulous necklace to wear at weddings, prom nights, pageants, parties, cruises and special functions! US$138.00. Item #N168196 - Miriam Haskell White Burgundy Rope Style Glass Seed Bead Vintage Estate Antique Necklace. Size: Length: 19" including the 3" extender. Designer: Signed MIRIAM HASKELL. Miriam Haskell made high end jewelry since 20's. Her costume jewelry is the collectible of the collectibles. Most of her pieces were signed from the 1940's onward. Miriam Haskell gorgeous high-quality white and burgundy glass seed beads fashioned bead after bead by hand into two twisted thick ropes and then intertwined with each other eccentuating texture, volume and color contrast. Each end is met with a gorgeous classic Miriam Haskell brass gilded filigree cap. Beautiful, showy and it's Haskell! Excellent condition. A fabulous necklace to wear at weddings, prom nights, pageants, parties, cruises and special functions! US$348.00. Item #N168383 - Multi-Strand Green Faux Pearl Rhinestone Goldtone Filigree Vintage Estate Antique Torsade Necklace. Luxuriant faux pearl 8-strand 20" generous length necklace in three gorgeous shades of green can be worn torsade or twisted rope style. Also, note the beautiful rhinestone slide-in clasp and the two accompanying goldtone filigree large caps lending for a decadent estate appeal. Show it off in front, side or back, whichever way, you'll look absolutely marvelous! Excellent condition. A fabulous necklace to wear at weddings, prom nights, pageants, parties, cruises and special functions! US$138.00. Item #N168419 - Clear Crystal Bead Vintage Estate Antique Necklace With Bell Tassel Pendant. Glistening faceted clear crystal beaded neck chain suspends a charming bell pendant! The large shiny silvertone bell cap is etched for gleaming texture and sprouts five glitzy clear crystal chains from within lending for a glittery spraying effect. The lovely bell pendant measures 2" long. Each crystal bead measures 1/4". 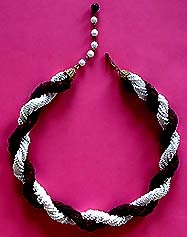 Patinum-like findings are used in this gorgeous necklace. Very pretty indeed! Near mint condition. A fabulous necklace to wear at weddings, prom nights, pageants, parties, cruises and special functions! US$118.00.